2.0 Added description to part 4 June 08, 2011. Hank, Steven. ● DailyHelper runs on iPhone/iPod touch ONLY. ● The development environment will be installed on the MacOS 10.6.7, and the DailyHelper runs on iOS 4.3. ● Development will be done using the Xcode IDE with iOS 4.3 SDK. ● The development device is MacBook. If the developers are using PC, the Virtual machine should be installed into their PC and setting up the MacOS in virtual machine. ● The data will be stored into database with SQLite engine. ● Everyone involved in the project shall not disclose the details of the project. ● Developers should keep the source code in secrecy. ● The system should properly protect privacy of customers. 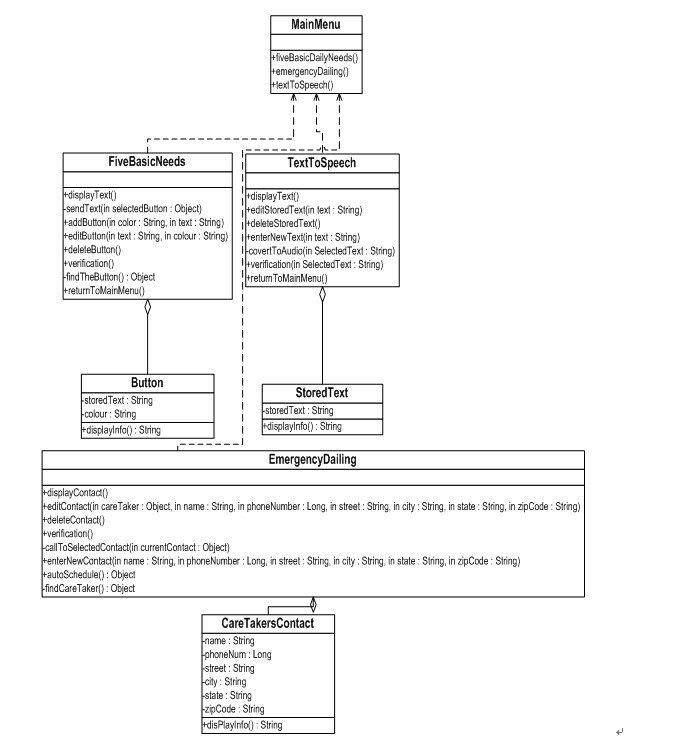 This data-flow diagram is regarding the first screen which will appear when the users open the DailyHelper. Once the users press the 5 basic needs mode button or text-speech mode button, it will go to the interface which is expected. If the users go into the Emergency button, it will make a phone call to caretaker directly. This data-flow diagram shows the data flow in 5 Basic Needs mode. When the user presses the Daily need / custom button, DailyHelper will send the message to caretaker’s device and tell them what the user needs. For the Custom setting button, the user can set their own basic need button. 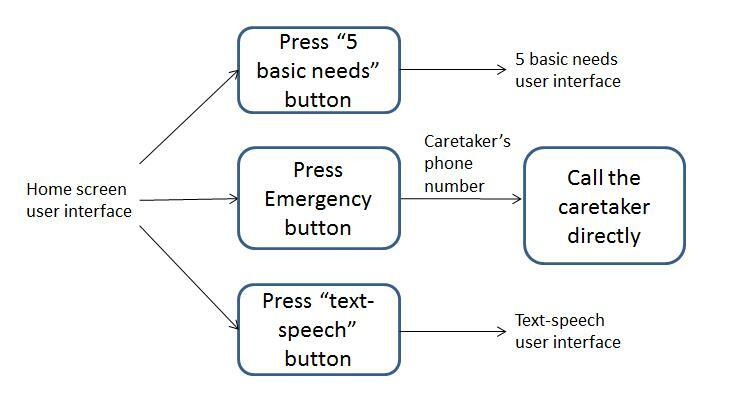 It is similar to the daily basic need button, but the message shows on the caretaker’s device is created by the users. Text-speech mode data–flow diagram shows that the input text could either output from speaker after transferring the text into audio or save as the regular sentence in the sentence book. When a sentence is chosen from the sentence book, DailyHelper would also transfer it into audio immediately and output from the speaker. 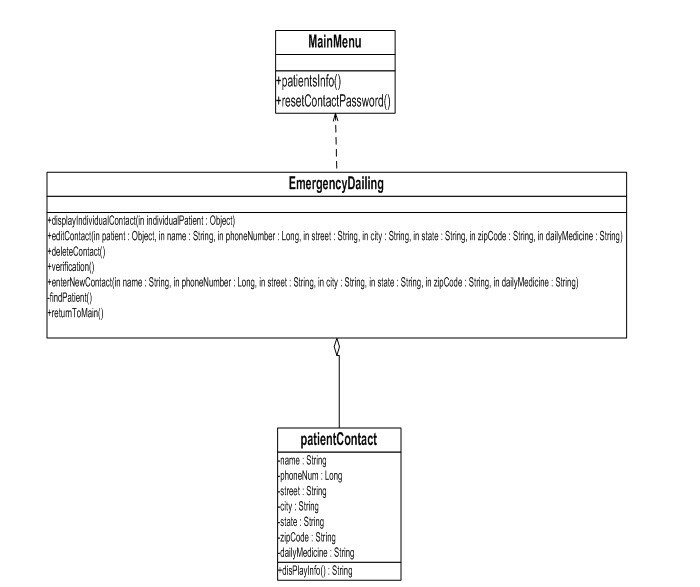 Object-oriented design is used as part of our system design process. The diagram below shows how each object interacts with the system and how they maintain their own state with provided operations. The password of the patient’s list will be stored in a .txt file, and it will be validated only when the user wants to edit, delete, and entered an individual. All other features do not require login process. The personal information of people who has been taken care of by the caretaker includes name, home address, telephone number and daily medicine will be stored in SQLite database. The format of all fields will be a string less than twenty characters except the telephone number is stored as a long type. All button icons used are in .jpg format. The personal information of the caretaker includes name, home address and telephone number will be stored in SQLite database. The format of all fields will be a string less than twenty characters except the telephone number is stored as a long type. All of the sentences either by user input or default setting will be stored in a .txt file. 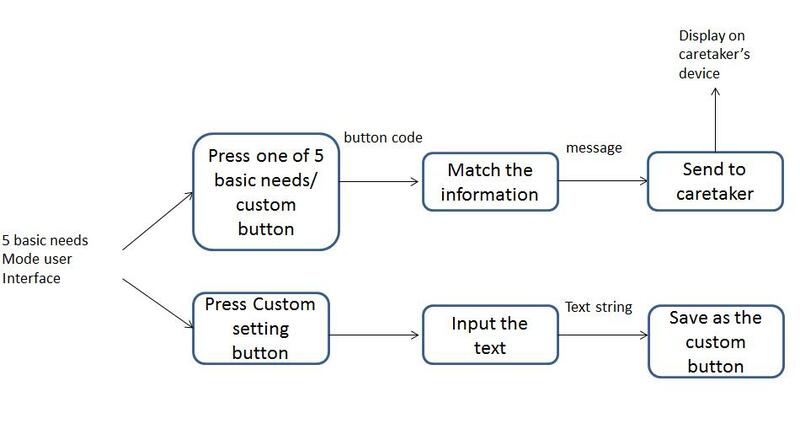 All of the data inputs should be performed by the user with the interaction system, for example, if the user wants to design their customized button, the description and the color of the button should be input by the user. The output data includes two parts: the first one is the buttons that displays on the screen and the information regarding the change of the database. The second one is the text to speech system which will be broadcasted by .wav file. Since the application is designed for iPod/iPad/iPhone, hand gesture will be used to interact with the system.